Jet.com’s new City Grocery experience now features a New York landmark: The Fulton Fish Market. Walmart subsidiary Jet said Wednesday that it has begun offering customers fresh seafood through the famous Manhattan venue for daily purchase. Under the partnership, Jet shoppers can order sustainably sourced seafood such as fresh bronzini, wild Chilean sea bass and wild yellowfin tuna and have it shipped to them the same day. The products are all fresh and never frozen, the companies noted. Initially, 24 Fulton Fish items will be sold via Jet. Pricing ranges from $7.99 for a 14-oz. package of tilapia (two 7-oz. filets) to $42.99 for a 12-oz. package of wild lobster tails (two 6-oz. tails). SKUs include whole fish, fish filets, shellfish (lobster, shrimp, oysters, clams and scallops) and Fulton Fish’s Prime offerings. Jet said seafood arrives at The Fulton Fish Market between 10 p.m. and 2 a.m. and then is delivered to the Jet Fulfillment Center in the New York City borough of the Bronx — a 10-minute drive away — at 8 a.m. Customers ordering on Jet before noon can schedule same-day delivery within a time window of 6 p.m. to 9 p.m. The companies noted that Jet is currently the largest e-commerce platform to partner with FultonFishMarket.com and the only one to provide same-day delivery of the vendor’s seafood in New York City. FultonFishMarket.com is an online startup based out of the Fulton Fish Market in New York. FultonFishMarket.com said another benefit of the service is the transparency it brings to fresh seafood, namely with mislabeled fish. 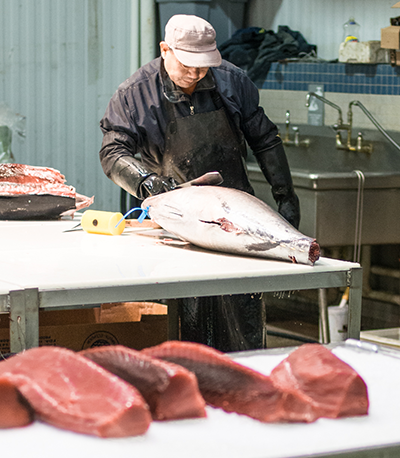 By procuring only whole fish instead of filets, Fulton Fish Market can properly identify each species and origin, which in turn ensures that Jet customers receive the fish that they ordered. Jet launched the City Grocery offering in the fall. The service is designed to cater more closely to the lifestyles of city dwellers, offering a range of groceries, daily staples and other merchandise for same-day and next-day delivery. Parcel, the New York-based delivery company acquired by Walmart in October 2017, provides last-mile delivery for the City Grocery service.